The tropical Atlantic has been putting on quite the show over the last couple of weeks of Hurricane Harvey (Category 4). . .I’m sure you heard of that one, followed by Irma (Category 5), Jose (Category 4), and Katia (Category 2). Katia made landfall last night in Mexico and now we continue our focus on Irma and Jose. Why is it so active? A few reasons: warm ocean (sea surface temperature and high ocean heat content), lack of a true El Nino Southern Oscillation (ENSO) signal, though it looks like a weak La Nina, little to no shear throughout much of the basin, a lack of dust from the Sahara, and a strong Azores high. Oh yeah, on top of that, we have the Madden-Julian Oscillation (MJO) more or less stuck in favorable phases for the Atlantic (8, 1, 2, 3) and forecasts suggest that stays in place for a while. ECMWF MJO verification and forecast courtesy of the Climate Prediction Center (CPC). Click here to open in a new window. GEFS MJO verification and forecast courtesy of CPC. Click here to open in a new window. One product I noticed in use at the Ocean Prediction Center (OPC) on Friday, 09/08/17 was the GOES-16 Daytime Convection RGB, so I thought this would be a nice opportunity to show you all three current Atlantic systems with a comparison to the 10.3 µm “clean” channel. GOES-16 Daytime Convection RGB of Hurricane Irma valid 1100 UTC to 2300 UTC on 09/08/17. *Preliminary, Non-Operational Data* Click here to open in a new window. Note the bright yellow coloring that highlights, new convection with smaller ice particles indicating strong overshooting tops in the outer rainbands, while the main central dense overcast (CDO) surrounding the eye also gets brighter. This indicates that after the eyewall replacement cycle ended, the new eyewall started to contract and strengthen (winds at this time were 155 mph, but shortly after this strengthened to 160 mph. GOES-16 10.3 um “clean” infrared window channel similar to the previous animation of Hurricane Irma. *Preliminary, Non-Operational Data* Click here to open in a new window. Notice that the 10.3 µm “clean” window shows us the brightness temperature of the coldest cloud tops. Although you can see the new overshooting tops, as those thunderstorms rotate around the CDO, it gets more difficult to identify the newer, important convection. GOES-16 Daytime Convection RGB for Hurricane Jose valid 1000 UTC to 2045 UTC on 09/08/17. *Preliminary, Non-Operational Data* Click here to open in a new window. By contrast, notice how compact Hurricane Jose became as it strengthened to a 150 mph Category 4 hurricane on Friday (09/08/17). Again, the beginning of the animation shows plenty of yellows that indicate new convection, wile the older convection fades to oranges, then reds. Also notice how the CDO becomes more yellow as the eye becomes cleaner and the storm takes on a more donut structure, even with the strong outflow channel to the northeast that makes the storm look lopsided. Could this RGB be helpful in identifying CDO changes? Or help with indicating eyewall replacement cycles (ERCs) in conjunction with microwave imagery? GOES-16 10.3 um “clean” infrared imagery similar to the previous animation of Hurricane Jose. *Preliminary, Non-Operational Data* Click here to open in a new window. Again, to contrast the Daytime Convection RGB, the above 10.3 µm animation shows very cold cloud tops, but the newer convection starts to blend in with the CDO over time. Do you see other differences? GOES-16 Daytime Convection RGB of Hurricane Katia valid 1200 UTC to 2357 UTC on 09/08/17. *Preliminary, Non-Operational Data* Click here to open in a new window. Finally, Hurricane Katia was very small in comparison with the other two hurricanes, but notice there are differences in the intensity of the convection on Friday (09/08/17). What do you see in the imagery? There are less yellows than in Irma or Jose, yet the storm intensified to a Category 2, 90 kt (105 mph) hurricane prior to landfall on Friday evening. 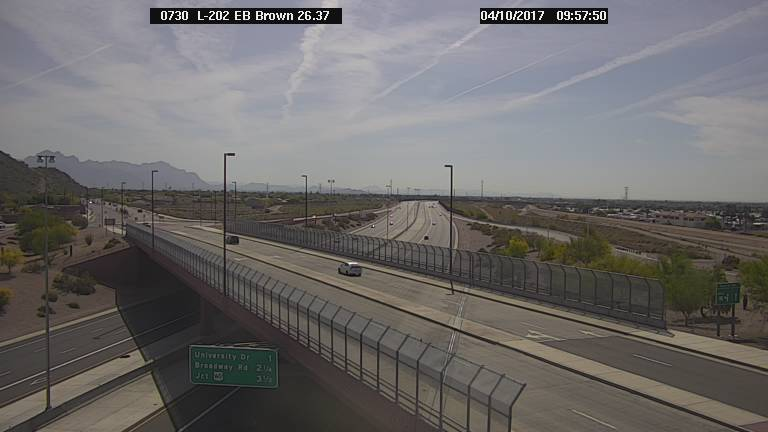 The warming clouds and less cold, newer convection may have been due to dry air entrainment due to the close proximity to mountainous land nearby and a weak trough to the north. GOES-16 10.3 um “clean” infrared imagery similar to the previous animation of Hurricane Katia. *Preliminary, Non-Operational Data* Click here to open in a new window. How does the 10.3 µm imagery above contrast with the Daytime Convection RGB? So, what is steering Irma? What about Jose and Katia? Well, I’m glad you asked. . .
GOES-16 Air Mass RGB image valid at 0900 UTC 09/09/17. *Preliminary, Non-Operational Data* Click here to open in a new window. The GOES-16 Air Mass RGB image (courtesy of NASA SPoRT) above with my crude drawings show a rough idea of the players affecting the steering flow around the three hurricanes. Katia has made landfall as it was pushed southwest due to the old cold frontal boundary (responsible for the cool air in most of the country) along with a disturbance highlighted in the yellow circle. This disturbance will close off over the Tennessee Valley area and help to pull Hurricane Irma north, then northwestward in the next 48 hours. Finally, Jose (east of the Lesser Antilles) will be pulled north through a weakness in the ridge due a weakness created by the Tropical Upper Tropospheric Trough (TUTT in the yellow “T”) to the northeast and Irma’s broad circulation. Since the current trough over the northeast U.S. moves east/northeast and the central Atlantic TUTT remains stationary, Irma gets left behind in the southeast U.S., but weakening after landfall, while Jose gets left behind and may perform a tight anticyclonic loop before “possibly” moving northwest. We’ll deal with Jose later. . . I have included the GOES-16 Air Mass RGB and 7.3 µm low-level water vapor animations below so you can get a better feel of the overall pattern. GOES-16 Air Mass RGB animation valid 0800 UTC 09/08/17 to 0900 UTC 09/09/17. *Preliminary, Non-Operational Data* Click here to open in a new window. GOES-16 7.3 um low-level water vapor animation valid from 0800 UTC 09/08/17 to 0715 UTC 09/09/17. *Preliminary, Non-Operational Data* Click here to open in a new window. My final thoughts. . .please follow the National Hurricane Center for official track and intensity guidance on Irma and Jose. I have included the track forecasts below. 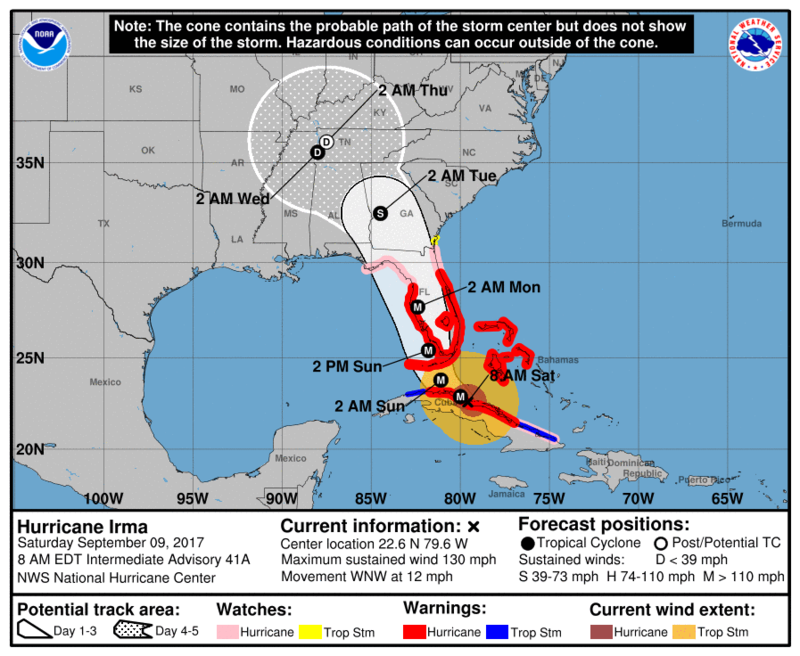 The 8 am EDT NHC track forecast for Hurricane Irma. Click here to open in a new window. 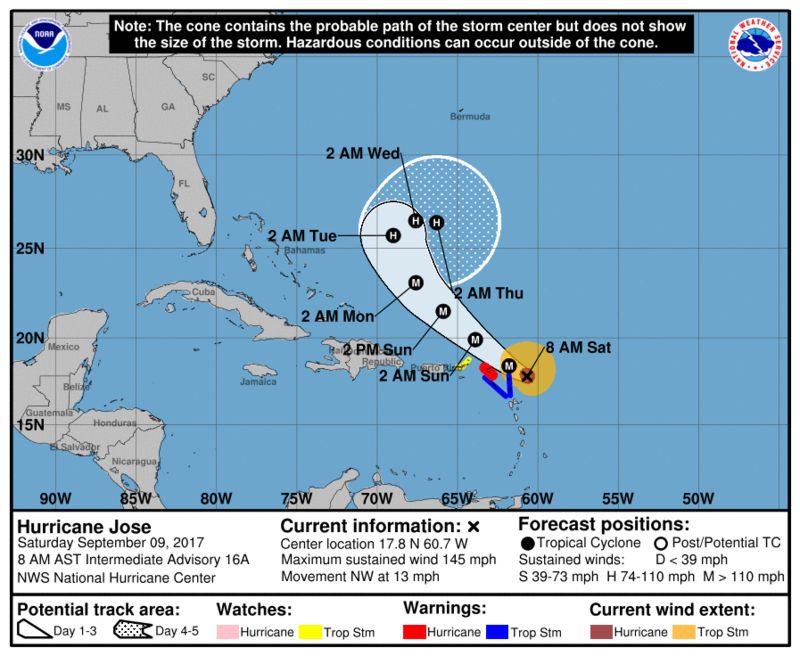 The 8 am AST NHC track forecast for Hurricane Jose. Click here to open in a new window. On 15 June 2017, the Storm Prediction Center had a Moderate Risk for Severe weather (for wind) out for much of the southeast half of Kansas, with a enhanced risk area (for hail) extending southwest into the Texas Panhandle. Morning GOES-16 split window difference imagery showed low-level moisture boundaries/moisture pooling setting up across the region. The relatively light shades of gray indicate regions of relatively high low-level moisture content. Of particular note is a w-e strip of ll moisture across western Kansas and another sw-ne oriented gradient extending from the Texas Panhandle into southern Kansas. By the end of the morning, cu could be seen developing within these areas. See this blog post for details on the split window difference. 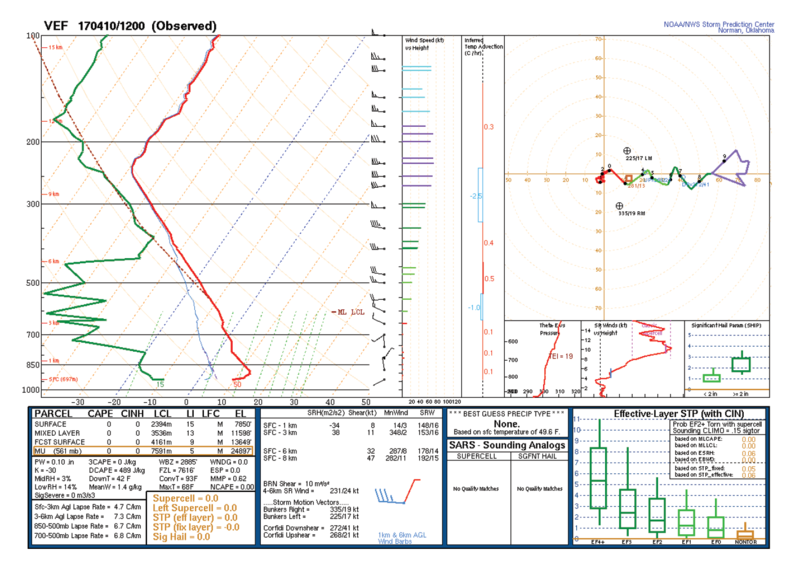 Convection would develop rapidly within the moisture plume identified in Kansas (Figure 2). The AWIPS Tracking Meteogram Tool provides forecasters with a means of graphing trends in a field. In this case, one can quantify and visualize how rapidly cloud top temperatures cooled with this storm. The developing thunderstorm cooled a remarkable 70C from 1727 UTC to 1827 UTC (10C to -60C) (Figure 3). Several GOES-16 derived products recently became available to NWS forecasters in AWIPS. GOES-16 CAPE and PW showed increasing values through the day prior to initiation. Storms in Kansas developed within a local TPW and CAPE max, while storms in Texas developed along a sharp gradient (Fig 4 and 5). The GOES-R TPW and Derived Stability Indices algorithms have been tested in the HWT using legacy GOES Sounder data as a proxy. Evaluations showed that the GOES-derived indices depict the location and movement of boundaries and local min/max well. More feedback on these products can be found on the GOES-R HWT blog here. Finally, a textbook overshooting top spotted with a storm in Texas (Fig 6). Measured roughly 10 miles in diameter, 15-20C colder than surrounding anvil. Severe hail reported with this storm. On the morning early of 04/06/17, TAFB forecasters noted a nice V-pattern to convection at the tail end of a front in the northeast Gulf of Mexico. The increased temporal and spatial resolution of GOES-16 compared to the GOES-13 (east) provided more details on the organization and maintenance of the convective line that would otherwise have been analyzed. Jorge Aguirre-Echevarria (TAFB Forecaster) noted that “the striking cloud/convective signature and associate lightning activity observed that day over the waters of the far southern Gulf of Mexico.” In particular, these events are rather rare at such a low latitude in the TAFB Offshore Zones. The GOES-16 10.3 μm infrared imagery proved to be very helpful in seeing the overshooting tops and the cold cloud canopy temperatures which signified the activity would persist west of Key West, FL.